Here’s a look at our Week 4 ACC Football Power Rankings. After a full slate of ACC games, which included some shaky moments for the Atlantic Division, David Glenn, Josh Graham and myself weigh in on the league: 1-14, starting with Clemson. This was also an exciting week for quarterback play in the league, which included N’Kosi Perry perhaps forcing a changing of the guard at the position for Miami. In his first ACC contest, Trevor Lawerence threw for a career-high four touchdown passes, including another one to freshman wideout Justyn Ross, who has three touchdown receptions (tied for third most in the ACC) on only six catches so far this season (172 yards). Oh, and Travis Etienne was a beast again, too: 75 rush yards after contact, per Pro Football Focus. Folks…after two years of hype, welcome to the N’Kosi Perry Show. 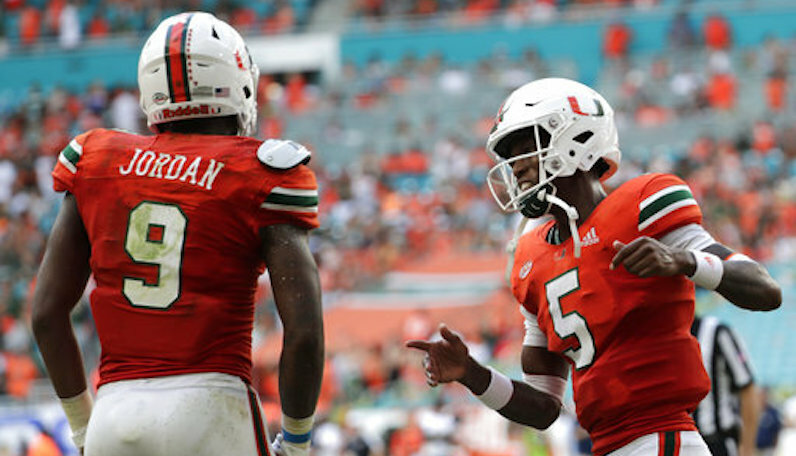 Perry replaced Malik Rosier at quarterback on the team’s third series; immediately, he started to deal, completing 12 of his first 13 passes for 170 yards and two touchdown. Perry, who finished the day 17-of-25 (68 percent) for 224 yards and three touchdowns in Miami’s 31-17 win over FIU, looked in rhythm with Mike Harley, who caught all seven of his targets. Miami’s offensive line gave him time to throw and he picked FIU apart. After back-to-back road wins over Power 5 opponents, Duke returned home and took care of business in the Bull City Classic — winning 55-13 over crosstown foe NC Central. Duke ran the ball 59 times for 372 yards, but Quentin Harris — in place of Daniel Jones — threw for 202 yards (7.5 per attempt), three touchdowns and no interceptions. Harris is one of nine FBS quarterbacks this season with 50+ pass attempts and zero interceptions. Stop me if you’ve heard this before: Eric Dungey returned from an injury and led another explosive offensive performance for Syracuse. The Orange, which rank No. 9 in the FBS in offensive plays per game (84), hung 51 points on UConn in a blowout home victory. Dungey completed nearly 78 percent of his passes and accounted for five touchdowns — which gives him 13 total on the season. 🤚 TDs for @CuseFootball's Eric Dungey. Is the grass the ground? In one of the biggest upsets of the college football season, No. 13 Virginia Tech (a 28.5 point-favorite) lost on the road to Old Dominion. Making matters worse, quarterback Josh Jackson injured his ankle against ODU and was unable to return. That adds intrigue to what has quickly become a rather important road contest for VT in Durham next Saturday. Is there a Monarch Nation? Led by Juan Thornhill, Virginia’s defense dominated Louisville in the program’s ACC opener: 214 total yards, three turnovers and just three total points allowed. However, the man who stole the show was quarterback Bryce Perkins who, against the blitz, roasted the Cards — and made a few highlights along the way, too. After a week of panic, Florida State quietly took care of business on Saturday against Rod Carey and Northern Illinois — winning by 18 in easily the best offensive performance of the Willie Taggart era. It was a so-so performance on the ground, but Deondre Francois lit it up through the air: 23-of-31 for 352 yards and two touchdowns. Still, some problems lurk, especially on the offensive line. Offensive tackles just killing FSU again. Missed a backer on first down. 2nd down RT gets beat and Francois sacked and fumbles. FSU really doesn't have any healthy offensive tackles on its roster right now. Pitt missed a big opportunity — a week after a win over Georgia Tech — on the road in Chapel Hill. UNC owns Pitt in ACC play as the Panthers allowed nearly 500 yards of total offense. Things get far more challenging next week, too: Pitt goes on the road to face UCF. Going back to the 2017 season, UNC is 2-1 in its last three ACC games — with both wins coming against Pitt. After Saturday’s 38-35 win, the Tar heels are now 6-0 against the Panther since Pitt joined the ACC back in 2013. North Carolina’s offense looked great, and Nathan Elliott put up a nice stat line, but Tomon Fox had a monster game on defense. DE Tomon Fox had a huge game today for UNC — seven tackles, two TFLs, and one sack. He will sit vs. Miami on Thursday, but Malik Carney will be back.